On an early spring day nearly 450 years ago, a young Spanish composer wandered through Rome where he had become cantor and organist at the church of Santa Maria di Monserrato. Tomás Luis de Victoria spent 22 years in the Italian city, from 1565 to 1587, and they were productivissimo. He held a number of prestigious posts, followed in Palestrina's footsteps as Maestro di Cappella at the Pontifical Roman Seminary, and took keen inspiration from the contemporary musical styles he encountered there. In return, his compositions influenced the thriving international community of composers in Rome. Orlando Chamber Choir’s programme begins with Giovanni da Palestrina’s rousing motet Jubilate Deo which highlights the Renaissance master’s influence on the younger De Victoria, whom he may have taught. We travel back in time to the Italian sojourns of Franco-Flemish composers Orlando di Lasso and Jacques Arcadelt. While in Rome they made their first forays into the madrigal form which, a few decades later, Luca Marenzio brought to its zenith with his chromatic style and exquisite word-painting – much to De Victoria’s admiration. At the centre of the programme are four motets by De Victoria, including his superbly-crafted twelve-part Laetatus sum and the sublime Vidi speciosam for six voice parts. Elements of Philippe de Monte’s motet Super flumina Babylonis suggest that, during his Roman years, he too was inspired by De Victoria’s writing. Our journey ends with a late work by Palestrina in which a wing-flapping angel descends from heaven, and with the Introit of the profoundly moving Requiem Mass by Roman-born composer Giovanni Anerio. 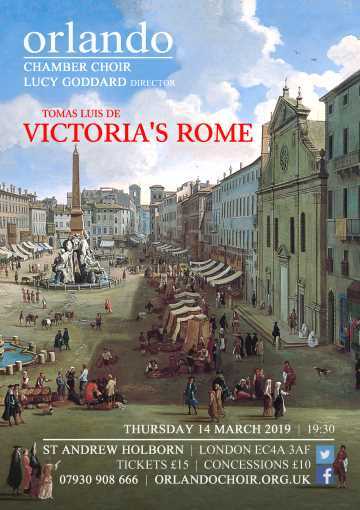 On his wander through Renaissance Rome, little did De Victoria know what influence his music would have, and how it would blend with his colleagues’ works into such a rich and varied programme.